The super-Earth 55 Cancri e (aka. Janssen) is somewhat famous, as exoplanet go. Originally discovered in 2004, this world was one of the few whose discovery predated the Kepler mission. By 2016, it was also the first exoplanet to have its atmosphere successfully characterized. Over the years, several studies have been conducted on this planet that revealed some rather interesting things about its composition and structure. For example, scientists believed at one time that 55 Cancri e was a “diamond planet“, whereas more recent work based on data from the Spitzer Space Telescope concluded that its surface was covered in lakes of hot lava. However, a new study conducted by scientists from NASA’s Jet Propulsion Laboratory indicates that despite its intense surface heat, 55 Cancri e has an atmosphere that is comparable to Earth’s, only much hotter! The study, titled “A Case for an Atmosphere on Super-Earth 55 Cancri e“, recently appeared in The Astrophysical Journal. Led by Isabel Angelo (a physics major with UC Berkeley) with the assistance of Renyu Hu – a astronomer and Hubble Fellow with JPL and Caltech – the pair conducted a more detailed analysis of the Spitzer data to determine the likelihood and composition of an atmosphere around 55 Cancri e.
Previous studies of the planet noted that this super-Earth (which is twice as large as our planet), orbits very close to its star. As a result, it has a very short orbital period of about 17 hours and 40 minutes and is tidally locked (with one side constantly facing towards the star). Between June and July of 2013, Spitzer observed 55 Cancri e and obtained temperature data using its special infrared camera. Initially, the temperature data was seen as being an indication that large deposits of lava existed on the surface. However, after re-analyzing this data and combining it with a new model previously develop by Hu, the team began to doubt this explanation. According to their findings, the planet must have a thick atmosphere, since lava lakes exposed to space would create hots spots of high temperatures. Using Hu’s improved model of how heat would flow throughout the planet and radiate back into space, they found that temperatures on the day side would average about 2573 K (2,300 °C; 4,200 °F). Meanwhile, temperatures on the “cold” side would average about 1573 – 1673 K (1,300 – 1,400 °C; 2,400 – to 2,600 °F). 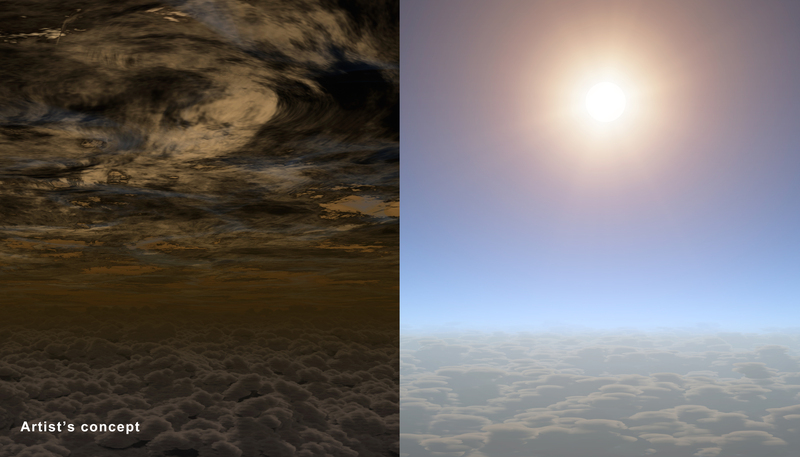 If the planet had no atmosphere, the differences in temperature would be far more extreme. As for the composition of this atmosphere, Angelo and Hu revealed that it is likely similar to Earth’s – containing nitrogen, water and even oxygen. While much hotter, the atmospheric density also appeared to be similar to that of Earth, which suggests the planet is most likely rocky (aka. terrestrial) in composition. On the downside, the temperatures are far too hot for the surface to maintain liquid water, which makes habitability a non-starter. Ultimately, this study was made possible thanks to Hu’s development of a method that makes the study exoplanet atmospheres and surfaces easier. Angelo, who led the study, worked on it as part of her internship with JPL and adapted Hu’s model to 55 Cancri e. Previously, this model had only been applied to mass gas giants that orbit close to their respective suns (aka. “Hot Jupiters”). Naturally, there are unresolved questions that this study helps to raise, such as how 55 Cancri e has avoided losing its atmosphere to space. Given how close the planet orbits to its star, and the fact that it’s tidally locked, it would be subject to intense amounts of radiation. Further studies may help to reveal how this is the case, and will help advance our understanding of large, rocky planets. The application of this model to a Super-Earth is the perfect example of how exoplanet research has been evolving in recent years. Initially, scientists were restricted to studying gas giants that orbit close to their stars (as well as their respective atmospheres) since these are the easiest to spot and characterize. But thanks to improvements in instrumentation and methods, the range of planets we are capable of studying is growing. Images of the Crab Nebula are always a treat because it has such intriguing and varied structure. Also, just knowing that this stellar explosion was witnessed and recorded by people on Earth more than 900 years ago (with the supernova visible to the naked eye for about two years) gives this nebula added fascination. Data from the five telescopes span nearly the entire breadth of the electromagnetic spectrum, from radio waves seen by the Karl G. Jansky Very Large Array (VLA) to the powerful X-ray glow as seen by the orbiting Chandra X-ray Observatory. And, in between that range of wavelengths, the Hubble Space Telescope’s crisp visible-light view, and the infrared perspective of the Spitzer Space Telescope. Astronomers have produced a highly detailed image of the Crab Nebula, by combining data from telescopes spanning nearly the entire breadth of the electromagnetic spectrum. This image combines data from five different telescopes: the VLA (radio) in red; Spitzer Space Telescope (infrared) in yellow; Hubble Space Telescope (visible) in green; XMM-Newton (ultraviolet) in blue; and Chandra X-ray Observatory (X-ray) in purple. Credit: NASA, ESA, G. Dubner (IAFE, CONICET-University of Buenos Aires) et al. ; A. Loll et al. ; T. Temim et al. ; F. Seward et al. ; VLA/NRAO/AUI/NSF; Chandra/CXC; Spitzer/JPL-Caltech; XMM-Newton/ESA; and Hubble/STScI. A new x-ray image of the Crab Nebula by the Chandra X-ray Observatory. Credit: X-ray: NASA/CXC/SAO. For this new image, the VLA, Hubble, and Chandra observations all were made at nearly the same time in November of 2012. 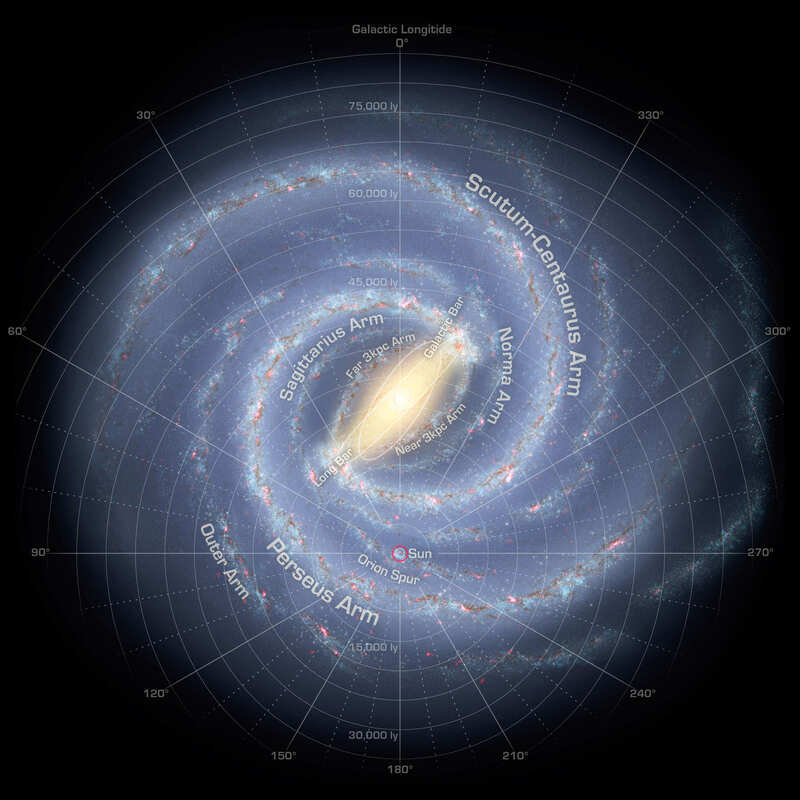 A team of scientists led by Gloria Dubner of the Institute of Astronomy and Physics (IAFE), the National Council of Scientific Research (CONICET), and the University of Buenos Aires in Argentina then made a thorough analysis of the newly revealed details in a quest to gain new insights into the complex physics of the object. They are reporting their findings in the Astrophysical Journal (see the pre-print here). A multi-wavelength layout of the Crab Nebula. Credit: (Credit: X-ray: NASA/CXC/SAO; Optical: NASA/STScI; Infrared: NASA/JPL/Caltech; Radio: NSF/NRAO/VLA; Ultraviolet: ESA/XMM-Newton). In an encouraging find for habitability researchers, astronomers have detected molecules on the smallest planet ever — a Neptune-sized planet about 120 light-years from Earth. The team behind the discovery says this means the dream of understanding the atmospheres on planets even closer to size of Earth is getting closer. Shining 24,000 light-years from Earth is an expanding leftover of a supernova that is doing a great cleanup job in its neighborhood. As this new composite image from NASA reveals, G352.7-0.1 (G352 for short) is more efficient than expected, picking up debris equivalent to about 45 times the mass of the Sun. “A recent study suggests that, surprisingly, the X-ray emission in G352 is dominated by the hotter (about 30 million degrees Celsius) debris from the explosion, rather than cooler (about 2 million degrees) emission from surrounding material that has been swept up by the expanding shock wave,” the Chandra X-Ray Observatory’s website stated. More information about G352 is available in the Astrophysical Journal and also in preprint version on Arxiv. What was the Universe like more than 13 billion years ago, just 500 million years after the big bang? New data from the Hubble and Spitzer space telescopes reveal some surprisingly bright galaxies that are about 10 to 20 times more luminous than anything seen previously in that epoch. Garth Illingworth from the University of California, Santa Cruz said the discovery of these four bright galaxies came from combining the power of both telescopes, but these galaxies lie right at the limit of the telescopes’ capabilities. Detail of the Hubble and Spitzer observations of a galaxy from the early Universe. Credit: NASA, ESA, G. Illingworth (University of California, Santa Cruz), P. Oesch (University of California, Santa Cruz; Yale University), R. Bouwens and I. Labbé (Leiden University), and the Science Team. Illingworth said the typical galaxy candidate from that far back in time is very faint and hard to see. But these new galaxies are about 15-20 % brighter than what astronomers have seen before at redshift 10. The tiny are bright because they are bursting with star formation activity. The brightest one is forming stars approximately 50 times faster than the Milky Way does today. Although these fledgling galaxies are only one-twentieth the size of the Milky Way, they probably contain around a billion stars crammed together. Astronomers think these bright, young galaxies grew exceptionally fast because of interactions and mergers of smaller infant galaxies that started forming stars even earlier in the Universe. Since the ancient time billions of years ago when the light that we now see started its long journey to us, they have probably kept growing to become similar to the largest modern galaxies. Many of the stars of these infant galaxies likely live on today in the centers of giant elliptical galaxies, much larger even than our own Milky Way. Slide from Garth Illingworth’s presentation at the 223rd American Astronomical Society meeting, describing the discovery of bright galaxies from early in the Universe. Credit: Garth Illingworth. Illingworth said this era appears to be a timeframe where things were changing quite rapidly. “We’ve gone back to a very interesting time when the Universe is changing,” he said. The galaxies were first detected with Hubble, and astronomers were able to measure their star-formation rates and sizes. But using Spitzer, the scientists were also able to measure the galaxies’ masses. Illingworth added that the mass measurements are rough estimates because of how challenging the task was. Illingworth and team member Ivo Labbé from Leiden University said they are looking forward to finding out more about these galaxies, particularly from future observations with the upcoming James Webb Space Telescope. You can find out more about these early galaxies — and more — at the First Galaxies website.